The Princess Royal was Queen Victoria's eldest child. Her christening took place in the evening in the Throne Room at Buckingham Palace. The throne had been removed for the occasion and was replaced by a temporary altar on which was set plate from the Chapel Royal. The silver-gilt Lily Font was made for the occasion and has been used for many royal christenings since. 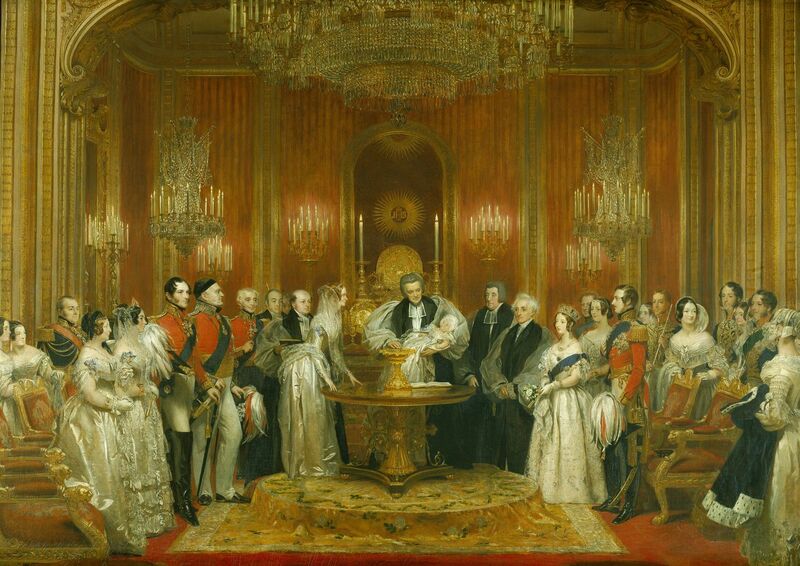 In the painting it stands on a table made for George IV and the chairs are from a set made in 1828. The Princess's royal sponsors were Queen Adelaide, the Queen Dowager, the Duchess of Gloucester, the Duchess of Kent, the King of the Belgians, the Duke of Sussex and the Duke of Saxe-Coburg-Gotha, for whom the Duke of Wellington stood proxy. In the painting the Queen Dowager steps forward to name the baby. The artist had asked Lord Melbourne if he might paint the christening, and Melbourne had shown the Queen the artist's letter. Leslie was admitted to see the ceremony and made 'a slight sketch of the Royal personages as they stood round the font in the room'. The artist made studies of the baby and the Queen in the months that followed, and particularly enjoyed studying the head of King Leopold ('the wisest and best of living kings'), seen here on the left in the long black boots, next to the Duchess of Kent. But by February 1842 the picture was still unfinished. The artist explained: 'I am chiefly waiting for the Queen Dowager, who has been at the point of death'. An engraving was produced from the painting in 1849 and an impression sent to the King of the Belgians, who described the likenesses as 'not quite successful'.